My day job for the past few years has been repairing and assembling bicycles as a professional mechanic at several bike shops across the country. I like the job very much, and I'm going to take the opportunity to get real braggy about how cool it is in this post. Working with my hands is very satisfying and bikes and their systems are often elegant, simple, and functional. The job allows me to encounter a huge variety of problems and come up with solutions. It is engaging, rewarding, and mostly satisfying. A good mechanic is a clever and creative creature, able to improvise and cross correlate a vast network of interrelated compatibilities. As a professional, you can get by just making stuff work, by consulting the manufacturer's spec and replacing the necessary components, but a good mechanic does more than that. The service manager at my first shop would brag, when he was in a good mood about a repair, that "we don't just fix bikes, we improve them." He was right. Repair, then, is inseparable from design. The process of completing a good repair, of improving a bike, depends upon being able to design a better system than the one that the bike came in with. The problem is almost always complicated by expectations of the customer and constraints of time and funding in the course of a day's work. Today, I had a very good repair, and I included some pictures to show the play between design and repair. Here is the rundown. On the left hand side of the photo above, there are the two silver cylinders with the three sided curved faces. These are the original hardware that comes stock on a set of Microshift 9 speed bar end shifters: when you tighten the allen wrench that is next to the cylinders into the black pods to the right of the frame, the curved face pieces press out against the inner surface of the handlebar, keeping everything snug by friction. I could have fabricated up some smaller diameter curved pieces to fit the smaller diameter of the bar that I wanted to fit everything into. However, I tried that once before on a similar project and found that it took far too much time to make sense in a shop setting with the tools that i have access to. Maybe with a mill, and a lathe, and a unicorn...but I digress. As with so many things, the problem and solution are more difficult to explain than they are to show. On the lower assembly, you can see how the bolt goes through the threaded bit, which was a salvaged cantilever stud cut off at the wrench flat. The upper assembly has the three pieces put together: the head of the silver lag bolt sits within the cavity of the shifter pod, allowing for free motion of the shift lever itself, and the head of the bolt can pull up against the lip of the top of the sawed off cantilever stud. 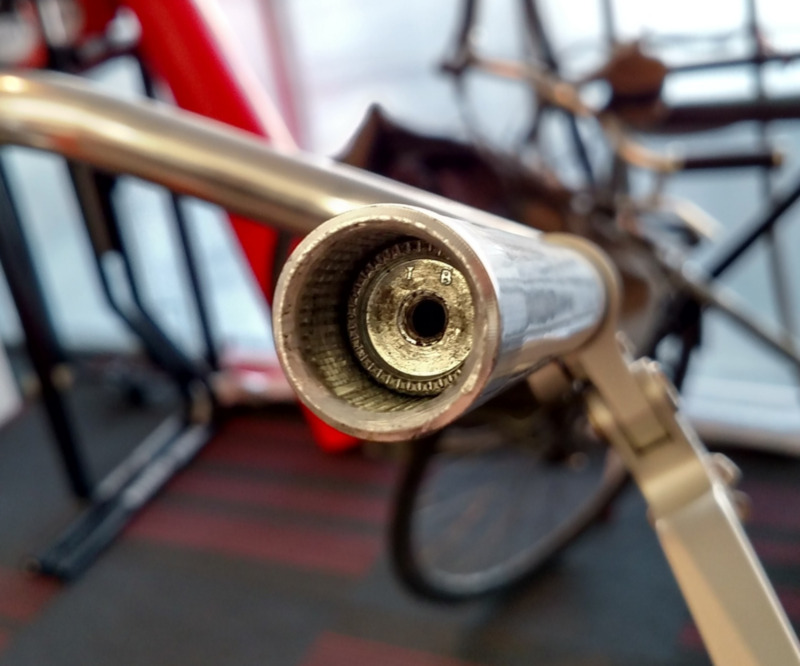 While the thread pitch of the cantilever stud was coarser than that of the inside of the shifter pod, it gained enough traction to allow the bolt to thread tightly into the plug that I had set into the handlebar. The black rubber cones to the right of the frame are actually rear hub seals which I used as a sort of gasket between the end of the shifter pod and the small gap between the end of the pod and the end of the bar. The rubber seal also is just a nice line that continues the slope of the shifter pod into the grip. It looks cool. I guess my point in laying all this out is to show the wide scope of thought that went into what looks like a pretty simple job. 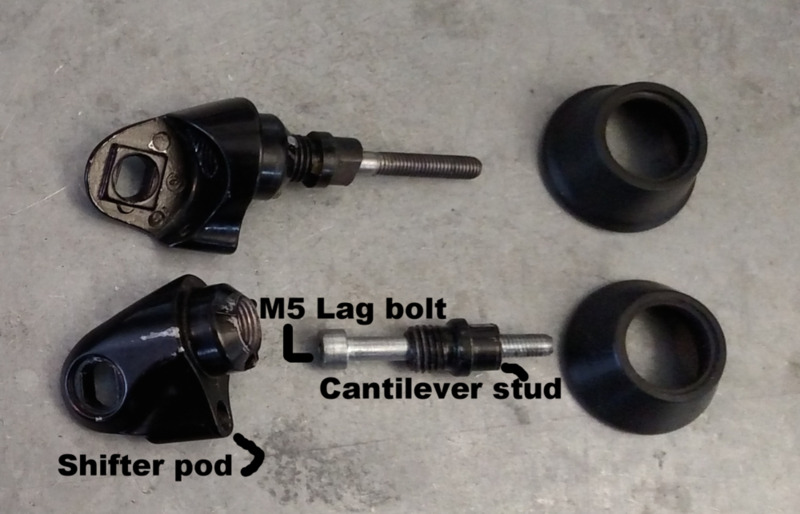 I thought of a threadless headset in order to mount a shifter, saw a star nut in the end of a cheap skewer, came up with the notion of using the cantilever stud as a shoulder for the lag bolt to bear against, and was able to put it all together. This process required a thorough knowledge of a whole lot of different parts of vastly different sorts of bicycles and a sort of creative spark to bring them all together usefully. My goal is not to brag so much as to point out what makes a good repair, what makes what I do so satisfying, and to show how much is involved in doing it right. It is not that anyone else couldn't have come up with this. We're not saving lives here, folks, just fixing bikes. But it is a beautiful, engaging process that is satisfying and useful. I didn't just plop some shifters from one set of handlebars onto another: I re-imagined the way that the component worked and was able to set it up using parts from around the shop, nothing custom or super obscure. Best of all, it is all un-doable, so if the customer doesn't like it or wants to change it up in the future, I have not permanently altered the parts that they paid for. It started as a simple request from a customer and ended up being a sophisticated process of designing a system under stringent restrictions of materials and time. Pretty cool.